Grant DeVolson Wood (February 13, 1891 – February 13, 1942) was an American painter best known for his paintings depicting the rural American Midwest, particularly American Gothic, an iconic painting of the 20th century. 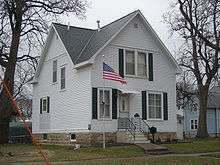 Grant Wood boyhood home, Cedar Rapids, Iowa. Listed as one of the most endangered historic sites in Iowa. Grant Wood was born in rural Iowa four miles (6 km) east of Anamosa in 1891; his mother moved the family to Cedar Rapids after his father died in 1901. Soon thereafter he began as an apprentice in a local metal shop. After graduating from Washington High School, Wood enrolled in The Handicraft Guild, an art school run entirely by women in Minneapolis in 1910 (today it is a prominent artist collective in the city.) He was said to have later returned to the Guild to paint American Gothic. A year later Wood returned to Iowa, where he taught in a rural one-room schoolhouse. In 1913 he enrolled at the School of the Art Institute of Chicago and performed some work as a silversmith. From 1922 to 1928, Wood made four trips to Europe, where he studied many styles of painting, especially Impressionism and Post-Impressionism. But it was the work of the 15th-century Flemish artist Jan van Eyck that influenced him to take on the clarity of this technique and to incorporate it in his new works. From 1924 to 1935, Wood lived in the loft of a carriage house in Cedar Rapids, which he turned into his personal studio at "5 Turner Alley" (the studio had no address until Wood made one up). In 1932, Wood helped found the Stone City Art Colony near his hometown to help artists get through the Great Depression. He became a great proponent of regionalism in the arts, lecturing throughout the country on the topic. As his classically American image was solidified, his bohemian days in Paris were expunged from his public image. Wood was married to Sara Sherman Maxon from 1935–38. She was considerably older and friends considered the marriage a mistake for him. Wood taught painting at the University of Iowa's School of Art from 1934 to 1941. During that time, he supervised mural painting projects, mentored students, produced a variety of his own works, and became a key part of the University's cultural community. It is thought that he was a closeted homosexual, and that there was an attempt to fire him because of a relationship with his personal secretary. Critic Janet Maslin states that his friends knew him to be "homosexual and a bit facetious in his masquerade as an overall-clad farm boy". University administration dismissed the allegations and Wood would have returned as professor if not for his growing health problems. In the early hours of February 13, 1942, his 51st birthday, Wood died at the university hospital of pancreatic cancer. When Wood died, his estate went to his sister, Nan Wood Graham, the woman portrayed in American Gothic. When she died in 1990, her estate, along with Wood's personal effects and various works of art, became the property of the Figge Art Museum in Davenport, Iowa. Throughout his life, he hired out his talents to many Iowa-based businesses as a steady source of income. This included painting advertisements, sketching rooms of a mortuary house for promotional flyers and, in one case, designing the corn-themed decor (including chandelier) for the dining room of a hotel. In addition, his 1928 trip to Munich was to oversee the making of the stained glass windows he had designed for a Veterans Memorial Building in Cedar Rapids. The window was damaged during the 2008 flood and it is currently in the process of restoration. He again returned to Cedar Rapids to teach Junior High students after serving in the army as a camouflage painter. Wood was one of three artists most associated with the movement. The others, John Steuart Curry and Thomas Hart Benton, returned to the Midwest in the 1930s due to Wood's encouragement and assistance with locating teaching positions for them at colleges in the states of Wisconsin and Missouri, respectively. Along with Benton, Curry, and other Regionalist artists, Wood's work was marketed through Associated American Artists in New York for many years. 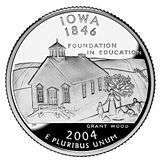 Wood is considered the patron artist of Cedar Rapids, and his childhood country school is depicted on the 2004 Iowa State Quarter. 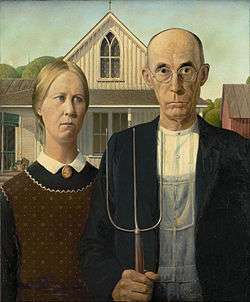 Wood's best known work is his 1930 painting American Gothic, which is also one of the most famous paintings in American art, and one of the few images to reach the status of widely recognised cultural icon, comparable to Leonardo da Vinci's Mona Lisa and Edvard Munch's The Scream. It was first exhibited in 1930 at the Art Institute of Chicago, where it is still located. It was given a $300 prize and made news stories country-wide, bringing Wood immediate recognition. Since then, it has been borrowed and satirized endlessly for advertisements and cartoons. Art critics who had favorable opinions about the painting, such as Gertrude Stein and Christopher Morley, assumed the painting was meant to be a satire of repression and narrow-mindedness of rural small-town life. It was seen as part of the trend toward increasingly critical depictions of rural America, along the lines of Sherwood Anderson's 1919 Winesburg, Ohio, Sinclair Lewis' 1920 Main Street, and Carl Van Vechten's The Tattooed Countess in literature. Wood rejected this reading of it. With the onset of the Great Depression, it came to be seen as a depiction of steadfast American pioneer spirit. Another reading is that it is an ambiguous fusion of reverence and parody. Wood's inspiration came from Eldon, southern Iowa, where a cottage designed in the Gothic Revival style with an upper window in the shape of a medieval pointed arch, provided the background and also the painting's title. Wood decided to paint the house along with "the kind of people I fancied should live in that house." The painting shows a farmer standing beside his spinster daughter, figures modeled by the artist's dentist and sister, Nan (1900–1990). Wood's sister insisted that the painting depicts the farmer's daughter and not wife, disliking suggestions it was the farmer's wife, since that would mean that she looks older than Wood's sister preferred to think of herself. The dentist, Dr. Byron McKeeby (1867–1950) was from Cedar Rapids, Iowa. The woman is dressed in a dark print apron mimicking 19th century Americana with a cameo brooch and a tightly-knotted tie, and the couple are in the traditional roles of men and women, the man's pitchfork symbolizing hard labor. The compositional severity and detailed technique derive from Northern Renaissance paintings, which Grant had looked at during three visits to Europe; after this he became increasingly aware of the Midwest's own legacy, which also informs the work. It is a key image of Regionalism. Wood was hired in 1940, along with eight other prominent American artists, to document and interpret dramatic scenes and characters during the production of the film The Long Voyage Home, a cinematic adaptation of Eugene O'Neill's plays. ↑ Preservation Iowa, 2008 Most Endangered Properties Archived January 5, 2016, at the Wayback Machine. ↑ Maslin, Janet Behind That Humble Pitchfork, a Complex Artist, In "Grant Wood", R. Tripp Evans Explores the Artist. New York Times, 3 Oct 3, 2010. ↑ Maslin, Janet Behind That Humble Pitchfork, a Complex Artist, In "Grant Wood", R. Tripp Evans Explores the Artist. Books of the Times, The New York Times, Oct 3, 2010.